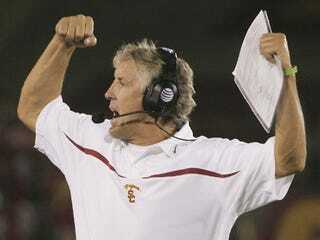 USC Receiver's Dad to Pete Carroll: "Treat My Boy! "; Grandma: "You're Drama!" I must admit that I am completely perplexed by the lack of attention your training staff is giving to Vidal’s injuries. When I asked Vidal if he received treatment today, he told me that the training room is closed today. In all of my years of associating with athletes, and corresponding with athletic trainers, I have never heard of a training room being closed on a holiday during the sport’s season. This includes Labor Day, Thanksgiving, Christmas Eve, Christmas, New Year’s Eve, New Year’s Day, etc. ... What is being done to ensure that my son is being cared for in a proper manner??? When is the USC training staff going to meet his medical needs??? It makes me wonder if the trust that I have extended is misplaced.